High Tides/High Sands | ¡VidaMaz! The last 2-3 weeks have seen tides higher than we’ve seen in a long time here. Often this time of year the waves splash up over the seawall near Valentino’s, sometimes even onto Avenida del Mar. 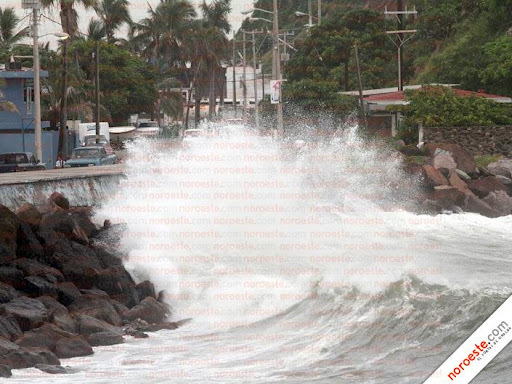 But this year, the waves have even been splashing onto the Avenida in Olas Altas. Last Thursday we were taking our morning walk and we had to turn back because we were getting sand blasted. We’ve noticed the last week or so that there are 2-3 inches of sand all along the malecón in various places, as well as onto the street. The surfers are of course happy with these waves, as are the body boarders. Though the waves are too high for some. The fishermen have not generally been pleased. The waves have overturned quite a few of the pangas, and the port as well as the beaches have been closed a few times due to the high seas. 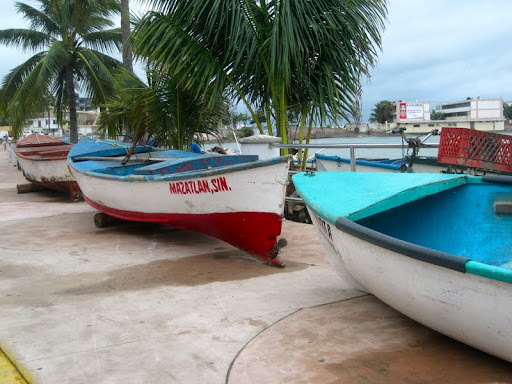 The fishermen have had to put their pangas up on the malecón several times for safe keeping. Shrimp season this year is predicted to be fantastic, thanks to all the high seas plus the rain. Today we bicycled down to the Pedro Infante statue. We were, gratefully, splashed by waves a few times as we rode. What was most remarkable, however, is that the beach is AT LEAST ONE METER HIGHER than it normally is! There are places where you can now almost walk from the malecón onto the beach. There are numerous palapas into which the waves are now entering freely. 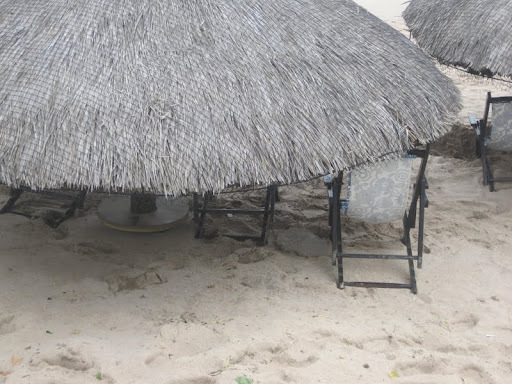 The few palapas that have laid concrete flooring, that are normally a foot or two above sea level, they now have sand for flooring. 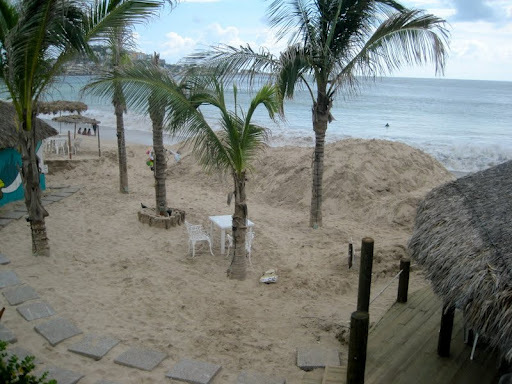 La Corriente and other palapas near the Hotel De Cima have had to bring in bulldozers to dig their spaces and furniture out from under the sand. In the photo at left, note that the round table is normally about one meter ABOVE the sand. The lower part of this palapa, normally, is well above head height. Not this week! 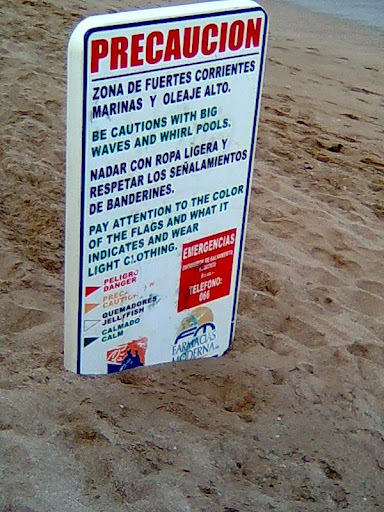 In this next photo, please note that the sign normally has a pole that keeps it a couple of feet/half meter or so ABOVE the sand. And all this, with no hurricane, and with no real horrific storm. It’s eerie. In addition to all the high seas, of course, we have had heavy rains. It is rainy season. Saturday a week ago we received in one day one-third of the rain we normally get in one year! Nine inches poured down in seven hours. Thousands if not tens of thousands of homes have been flooded repeatedly, and most of those families have lost all their furniture. It rained high in the Sierras as well, and as the rivers brought all that rain down to the sea, the rivers carried in them tree trunks, dead cows and pigs, silt, sediment, and trash of every sort. The tides were just right that the rivers washed it all out to sea, and then the waves came in and washed it all up to the beach. Everyone has spent the last two weeks cleaning up wood and other items from the beaches. It’s been a remarkable, community-wide effort. Great post, really is a strange time here. I haven't been to La Corriente in a while, what a mess! I wonder if the sand will leave again this winter?